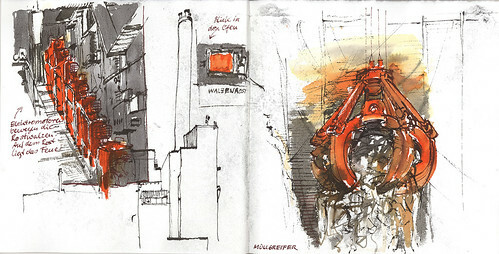 The Urban Sketchers Rhein-Main visited the GML, a waste-to-energy plant in Ludwigshafen. We had a guided tour with three locations to draw. At every location we stayed about half an hour. I had to decide between this guided tour and a beautiful swimming bath, built in 1956, which serves now as water reservoirs for firefighting. Because I never saw a waste-to-energy plant from inside I chose the guided tour even though the weather was very good. We had a great day! Thanks to Chris for organizing the event.